Rereading the Fantastic Four comics from the start. Continuing from the previous issue, #270 finds our heroes in the midst of difficult personal change while fighting one very big bad guy. At headquarters, Franklin finds Sue in Reed’s lab, which she destroyed in a fit of anger. She assured Franklin that she’s OK, while also struggling to communicate the fight way to him to describe how she feels. She uses the “4” flare gun to signal Johnny, but he’s flying around NYC too distracted with thoughts about Alicia to notice it. Then there’s a short scene in Houston, where a politician and a bunch of scientists express concern over the massive crater somewhere in the American Southwest, emphasizing that members of the Fantastic Four are on the scene. In that crater, She-Hulk, Reed, and Wyatt survived an attack from Terminus, and they regroup. Terminus destroys vast miles of land, commenting that the people of Earth won’t make good slaves (yeesh). Terminus pulls out a small capsule containing a tiny alien. 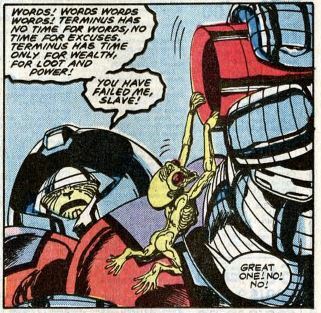 The alien complains that Terminus didn’t give him enough time to find a world with plentiful resources, and Terminus just tosses him to the ground. Terminus says all he cares about is wealth, loot, and power. There’s even more mass destruction as Terminus rips up the surface of the Earth and fills the sky with swirling molten lava. Reed and company find the small alien, who from their perspective is twice as big as a human. 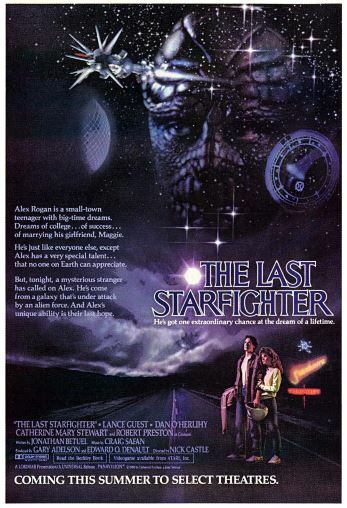 The alien says he lied to Terminus, and that he believes there are “cosmic energies” around the Earth signifying heroes with the ability to stop Terminus. The alien dies, and our heroes wonder how to defeat Terminus. She-Hulk makes a crack about hitting him with the whole planet, and this gives Reed an idea. 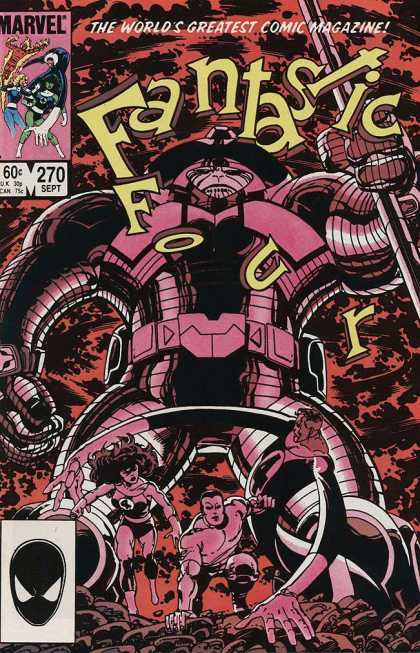 Terminus marches toward a nearby city, only to be distracted when She-Hulk throws the remains of the FF’s jet at him. 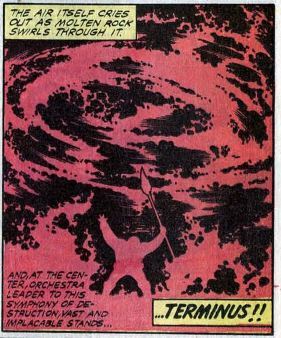 Reed takes advantage of the surprise by stretching up to Terminus’ head and attaching a device to it. Terminus shrinks down to small size and is sucked deep into the Earth. Reed says this is his acceleration device he showed off in the last issue. It gave Terminus a velocity of twenty thousand miles per second in an instant, against the direction of the Earth. Terminus isn’t defeated, however. Instead, it will take him months to climb back up to the Earth’s surface. The ground then collapses, so that Wyatt and She-Hulk fall against each other for some flirtatious banter. The issue ends as we wrap up Wyatt’s subplot, where he turns down the offer to be his tribe’s new chief. Although his tribal elders have great wisdom, he says, they haven’t seen the things he’s seen on his adventures. Reed says Wyatt will always have a place with them in New York, among the Fantastic Four. Unstable molecule: A lot of readers over the years have wondered why Reed doesn’t just pull out this crazy acceleration machine any time there’s a villain or giant monster. Based on dialogue in this and the previous issue, we can surmise that the tech is both unstable and highly dangerous. Fade out: In the midst of Sue’s sadness, she considers how others have been referring to as the FF’s most powerful member, and she starts to think of herself that way, too. Flame on: Johnny has had workers divide up his loft into rooms, including an upstairs bedroom. There’s also a large skylight, for quick entrances and exits when flying. Fantastic fifth wheel: This issue officially begins the She-Hulk/Wyatt romance, which is going to be a “thing” between them for quite some time. Four and a half: This issue establishes that Franklin is five years old at this point. The Alicia problem: The story goes that Lyja was meant to infiltrate the FF, only that she fell in love with Johnny for real. Their dialogue in this issue could be interpreted either way. I’m thinking it makes more sense for her to fall for him genuinely. Even though it’s early for that, a lot of what’s going to come later makes sense if we go with this now. Trivia time: After being defeated so quickly in this issue, Terminus would later go on to menace the Avengers several times, where he finally achieves the mega-villain status promised by this story. He even got to star in his own Marvel crossover event, The Terminus Factor. He also has the distinction of crashing the DC Universe and fighting the Justice League in JLA/Avengers. Although H.U.B.E.R.T the robot doesn’t appear in this issue, the letters page reveals that his name stands for “Hyper-Ultronic Brain-Employing Randomized Tracings.” Freakin’ H.U.B.E.R.T. the robot. Fantastic or frightful? Again, the issue doesn’t address the seemingly millions of deaths caused by Terminus before he’s abruptly defeated. This arc is really about all the little character moments, such as Johnny and Alicia bonding, and Wyatt’s big turning point. John Byrne’s art continues to be terrific.